We begin Advanced Notching with a look at Mold Lines. These lines, are when placed on the flat pattern or drawing, represent that area that will be radius after forming. 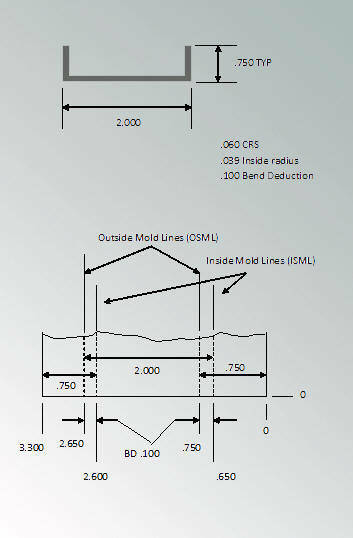 Which line is the Outside Mold lines and which is the inside? This is relative to which end of the part you are working from; but, generally speaking, the Outside Mold line is the outside dimension of the flange and the Inside Mold Lines is one bend deduction less. In figure 1, we see a simple part with two .750-inch flanges and an Overall dimension of 2.000-inches; the Bend Deduction is .100-inches and the material; Cold Rolled Steel is .060-inches thick. The area between those lines will be radius after forming. The dimension to the second outside mold line is found by adding the outside dimension of the overall, to the inside mold line from the first bend. Subtracting one full bend deduction from the second outside mold line, we again get a second inside mold line. 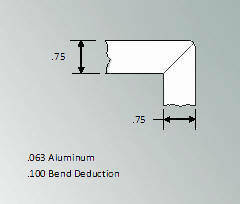 To that dimension, we add outside flange dimension (.750) of the second bend to find the total flat blank dimension. Once placed on the flat pattern, you will be able to determine if any features are going to lay on the radius and therefore distort during forming. You will also learn the role that mold lines play in determining the notching coordinates in the remainder of this chapter. 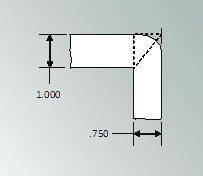 Figure 2 shows a side view of a part featuring two side flanges of equal length, bent to 90-degrees, and a single perpendicular flange also bent to 90-degrees.Laying out the notch requires you to use the Mold Lines. Finding the Outside and Inside Mold lines, as previously described, along with the center lines, we can develop the X-Y coordinates for the outside notch corner coordinates. Find the intersection of the two center lines of the bend; halfway between the mold lines. This is your first of three points. in our example .750. That is the coordinates of the notched corner closest to the zero-zero corner. Program or layout the part and cut the notch out. 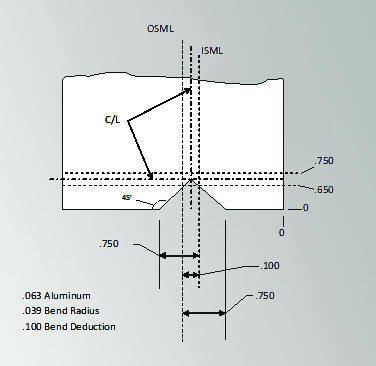 We have found the points and made the notch while taking into account the elongation of the part during forming, figure 3. Just as a point of note, if the notching is by hand, getting the notch perfect is much harder to accomplish and may require a small amount of hand filing in order to get the notch to close up correctly. This, however should not be a problem if the part is produced by means of a turret punch, laser or water jet. Unequal flanges create a special issue, the shifting of the center point. In essence, this means tipping the notch slightly. This is necessary to insure that the bottom corners close and meet squarely. 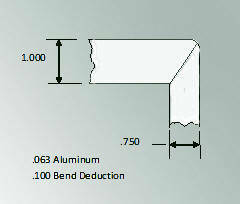 In figure 4 we find a part with two flanges, the first is one inch and a second .750-inches in conjunction with a single perpendicular bend (not shown). 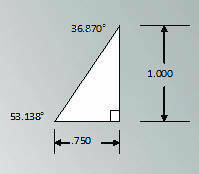 The first step here is to find and define the Right triangle at the intersection of the bend notches, figures 5 and 6. 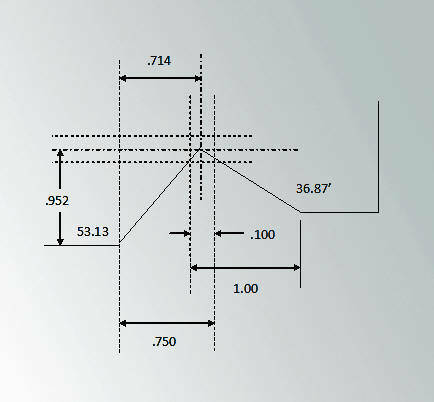 In figure 7, find the Inside Mold Line and follow the .750 addition to the corner of the notch furthest from the zero-zero corner; now, follow that up to where you see the .714 dimension. That .714 dimension is read back to the centerline of the bend. But, note, that under equal flange layouts, that centerline .714 dimension would actually be called at .700. 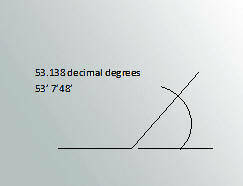 The .700 dimension is arrived at by subtracting one-half of the bend deduction, which in our example is .100. One half of that is .050, so.750 -.050 = .700. So where did the extra .014 inches come from? There is a shifting of the center-line by .014-inches back toward the zero-zero point. There is also a shifting along the “Y” axis as well. Again the shifting or tipping of the notch allows the notch corners to meet at right angles. In Figure 7, detail A, we are looking at the intersection of the centerlines. The .100 dimension represents the square found at the intersection of the mold lines of both axis’s and is equal to the bend deduction in dimension; which is the same on both axes. 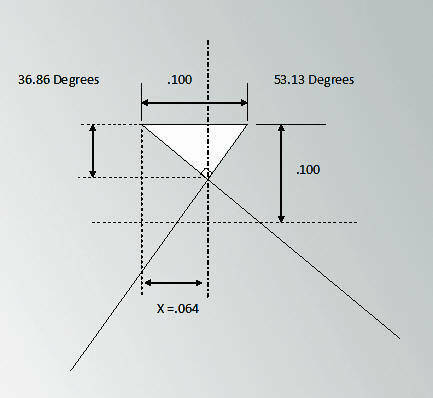 Note how the angles from figure 6 are applied by reviewing figures 6 and figures 7 details “B” and “C”. Solve for the right triangle defined by Y = .048 and X = .064 in figure 7, detail “A”. Once the triangle formed at the intersection has been defined, we perform the following process is necessary to develop the notch. 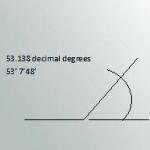 The bend deduction is .100-inches and the X value is .064-inches. To find the center of the notch, we first locate the outer notch coordinate by adding the .750 dimension to the Inside Mold Line. From that new location, we subtract one-half of the bend deduction .050-inches to get to .700 plus the shifting value of .014-inches for a notch center location of .714-inches. This shifts the notch center .014-inches back toward zero-zero. On the 1.000 axes, we again find the center-line and add the shifting to it. 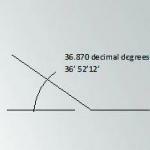 Figure 8, detail “A”, equals .048; take .048 from .050 for a difference of .002-inches. 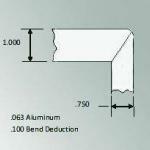 The centerline for the 1.000 flange is located at .950 plus the .002-inch for the relocation. This makes the relocated center-line at .952-inches.